Knee pain is common. It’s the most common reason people see a doctor. It affects men and women of all ages. Injuries, overuse, arthritis, pain, swelling, stiffness, and limited range of motion all occur. Sometimes you know exactly when / what happened. Other times it seems to come from out of nowhere. The knee is a complicated joint that not only holds us up it allows us to move. It hinges so we can sit, stand and walk. The knee also lets us twist and rotate. It works in tandem with bones, ligaments, tendons, and cartilage. It also connects to the non-weight bearing fibula (calf bone) attached by ligaments. Four tough ligaments connect the bones together and allow for smooth movement. Tendons connect the meniscus cartilage to bones. This cartilage lies along the top of the tibia and between the knobby protrusions of the femur bone. It provides cushioning between the bones. There are also bursae…fluid-filled cushions. Three groups of these protectors take the impact from running and jumping. 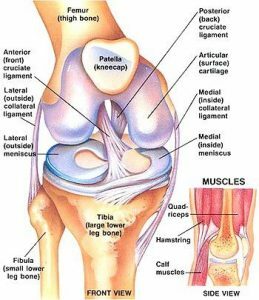 Above the knee… the patellar ligament and quadriceps tendons allow the leg to straighten. Knee pain can come from all sorts of triggers. A fall, twist or other injuries, overuse, or arthritis. It can also come from gout or an infection. Symptoms include pain, swelling, redness, stiffness and limited range of motion. The pain can come from the knee, but also the hip, ankle or lower back. The first step is to attempt to break the inflammation cycle. Protect – support the joint if needed. Stop activities that make it hurt. Rest – the knee needs rest to heal. Ice – several times daily. Compression – a compression bandage may help with swelling and offer support. Elevate – Get the knee up whenever possible. Use a footstool when sitting or a recliner. Anti-inflammatories may also help – check with your doctor if you have other health issues. Medically, they recommend trying the PRICE therapy for a week. If there is no improvement, you may need medical help. However, if the pain is severe, your knee won’t support you, you are running a fever…see a doctor. Therapies include diagnostics to identify the problem. You may need x-rays, MRI or CAT scans, examination, etc. If a bone is dislocated, doctors can shift it back into place. Torn ligaments may need repair. Inflamed bursae may need to be drained. A chiropractor may be able to do adjustments if the cause is an alignment issue. An LMT trained in the Berry techniques may be able to alleviate swelling and pain. They may be able to coax a ligament back into position. Rebalancing, stabilizing and relieving pain are the goals. To reduce the risks of knee pain, be aware of your body. Practice weight management. The heavier you are, the more strain it places on your joints and the more they may complain. Move – walking is your friend. With proper supportive shoes, it is low impact. If your knees are problematic, consider swimming or water supported exercise. Keep limber, fit and build strength. If you notice pain increasing when you are exercising – STOP. If you realize you’re tired – STOP. Protect your body and it will take good care of you. Are you a licensed massage therapist? Would you like to really help your clients with knee problems? Join me for an upcoming Knee Workshop, and I’ll share the Berry Techniques that I’ve used for 40 years. They relieve pain and help people get on with their lives. Check the class schedule for upcoming dates. I’ve taken many other classes in lymphatic work, but none of them are as effective in treating edema. For years I have focused on using the Berry Method® for edema… instead of traditional lymphatic massage. These Berry techniques have more practical applications than any other lymphatic massage method. Besides addressing edema, they can restore a client’s ability to breathe. This literally saves lives… and improves the quality of life for anyone with respiratory issues. This lymphatic technique can be taught to a family member to ease congestion around the heart and lungs. In a healthy person, there is a vacuum around the lungs. They have a healthy sounding voice and no trouble speaking or breathing. When the vacuum has been compromised the voice becomes very wispy and breathy. Fluids that have seeped into the vacuum make it hard for the lungs to expand and take in air. We compress the cavity around the heart and lungs to remove the excess fluid and air bubbles. This restores the vacuum and allows the lungs to function normally. Not only does the patient feel better immediately… they can take a breath and talk normally. “As a home health professional, I frequently encounter complex lung and lymphedema situations involving dyspnea (difficulty breathing). After learning Lauren’s vacuum technique in Lynn’s informative Lymphedema management class, I applied it to a woman with heart failure and an acute episode of shortness of breath. 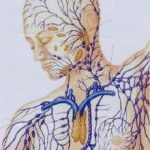 If you have an aging family member or your work involves senior care, you need to know this lymphatic technique. It’s great for breathing problems and symptoms of chronic respiratory issues. Clients with asthma, sinuses, or swelling have commented on their immediate improvement. If you’re wanting to help a family member, please contact me and come in for an appointment. Bring them with you so I can teach you the technique. Or, attend an upcoming Lymphatic Technique for Home Use Workshop. We have options for you to attend as an individual, couple or family. For professionals please join me for my in-depth CEU Lymphatic Massage workshop. You can find a complete list of classes here. This is a fabulous article about pain receptors for healthcare professionals. I hope you enjoy the read. Sore wrists? Tingly fingers? Little electrical sparks in wrists, arms, fingers? If you have cranky wrists, soreness, tingling in your fingers, wrist or arm, you may have Carpal Tunnel Syndrom, (CTS). There may be a buildup of pressure in the wrist, it can also extend to the elbow or even the shoulder. Carpal Tunnel used to be a problem typically found in the elderly, worn out wrists. Today it is showing up in Generation X, the Millennials and more. Why? The repetitive motions of the wrist or hand. Texting, gaming, stretching and gripping, twisting of the wrist can all contribute. It’s common for the first symptoms to be a tingly sensation in the fingers. Maybe it wakes you up at night. Perhaps you notice it when using your gaming control. Or maybe you feel numbness when driving long distances or gripping something firmly. Massaging or shaking your fingers may help, temporarily. Ignore the symptoms and it will get worse. You will feel more pain, tingling, numbness, sparking. You might start dropping things. The good news – there are treatments and preventative measures. The sooner you take action, the less risk of permanent nerve damage or disability. Early diagnosis is key. Not sure if you have Carpal Tunnel? Here’s a simple self-test you can do. Holding your arms out in front of you connect the heels of your hands together at the thumbs. Let the fingers drop toward the ground to create a 90° angle. Hold the position. If you start to feel numbness in the hands or wrist the median nerve is being pinched. This is a test positive for Carpal Tunnel. Often the first treatment will be wrist braces that you can wear at night. When we sleep, we curl our hands and wrists into odd angles as we snuggle into our favorite fetal curl. While everyone is different, many find the braces dramatically reduce the symptoms. Who likes surgery? If you are like most of us, you don’t. If there’s a good way around it, we want more knowledge. 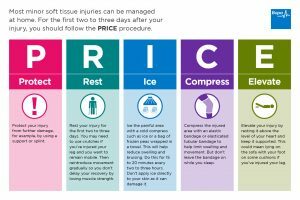 Surgery comes with a high price tag, downtime and rehab time. Results are never guaranteed and there can be side effects. If you are prone to keloid scarring, this can affect your outcome. There are other risks including permanent damage to the nerves in the wrist. But there are alternative choices. The first step is to reduce the inflammation and associated pain. Herbs like curcumin, cinnamon, garlic, ginger, cloves, sage, and rosemary are known for their anti-inflammatory properties. You can take them in supplements. B-6 and magnesium are often recommended to take in conjunction with these to enhance results. Your naturopath or chiropractor can assist you with blends and dosage. Some people find quick relief with a topical cannabis balm or cream. Users find it helps arthritis, acute pain, and muscle soreness. The CBD formulation has no psychoactive properties… you won’t get high. Some manufacturers sell small trial sizes which is a good way to find out if it works for you. Many formulas include traditional botanicals known for their anti-inflammatory properties like arnica. Using a topical for pain control does not address the underlying issues. For that, you need the Berry Method® of intervention. 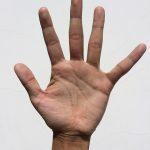 The Berry Techniques of manipulation were developed by a physical therapist over 40 years ago. Lauren Berry considered himself a body mechanic. Studying human anatomy and what happened when there was injury, he found ways to relieve the pain, reduce inflammation and restore mobility. It didn’t take dozens of visits. Seek out a massage therapist or physical therapist knowledgeable in these techniques. They can break up the scar tissue in the ligaments of the wrist. This relieves the pressure on the median nerve. Many times the pain is gone by the end of the treatment. For other patients, a follow-up may be needed. Your therapist can also show you how to maintain your pain-free status and prevent re-occurrence. It’s a simple procedure but the results can feel like magic. Pain, numbness, tightness…gone. Surgery unnecessary. If you are suffering from cranky wrists, numbness in the fingers or sparks in your wrists or arms, contact Lynn today. She’ll help restore your joint balance, range of motion and flexibility. Call: 541-603-8031. Interested in learning these techniques to help your clients? She has classes upcoming in Eugene and Las Vegas. Visit our class pages. For what her clients say, please visit Testimonials.